The city where fires are burnt day and night and water is full of corpses. According to Hindu beliefs about the universe structure, Varanasi is the center of the world, one of seven sacred cities in Hindu tradition. Ganges, the third deepest river in the world, begins its way in the Himalayas' glaciers and takes its waters through the whole India. On its Western shore in Uttar Pradesh state a sacred city of Varanasi is situated. According to Hindu beliefs about the universe structure, Varanasi is the center of the world, one of seven sacred cities in Hindu tradition, an important place for the pilgrims not only from India, but also from all over the world. The legend says, the city was built by Shiva. The mentions of Varanasi can be found in ancient Indian literature: Ramayana, Mahabharata and Rigveda. The apparent age of the city is 3,000 years, it's one of the oldest cities in the world and probably the oldest one in India. Ancient travelers noted the large quantity of monasteries and universities in Varanasi. This place has been thought to be the center of cultural life, education and science since long ago. The writer Mark Twain commented on his visit there: "Benares (alternative name) is older than history, older than tradition, even older than legends and looks twice as old as all of the above said together". People in Varanasi are as diverse as one could imagine. There are lots of Sadhu ascetics here, who are Hindu saints and are thought to clear up the karma of the whole humanity with their devotion. However, there are also usual frauds who mask themselves as yogi and beg for money. You can meet anyone in this city, from the sellers of dopey powders to the Hindu mystics fans from all over the world. The concept of white-black, good-bad, that is peculiar to Western societies, is not familiar to Indians. That's why Indians often don't see anything horrible and disgusting in something that the Europeans would consider such. It's quite descriptive of Varanasi. It's probably the best place for feeling and comprehending the complicated Indian culture, where life and death are inseparable. Thousands of people from all over India come to Varanasi every day to end their lives. It's thought that death in this sacred city helps for great rebirths, clears up the karma. That's why funeral pyres are flashing there all day and all night. All of them are lit up using the ritual fire, which in its turn was lit up by Shiva himself. Of course, it's constantly being watched. The center of all activities in the city is the Ghats (quays and ladders leading to the river). Manikarnika Ghat is the main crematorium of the city, the lines of funeral processions are getting here every day, also mantras with which the dead are guided into their last journey can be heard constantly. Funeral pyres show their flames on the riverbank itself. The process of cremation is conducted by the part of the caste of Dalit, they are untouchables, but, however, don't have any financial problems. Every day they sift the ashes in hopes to find the jewelry. 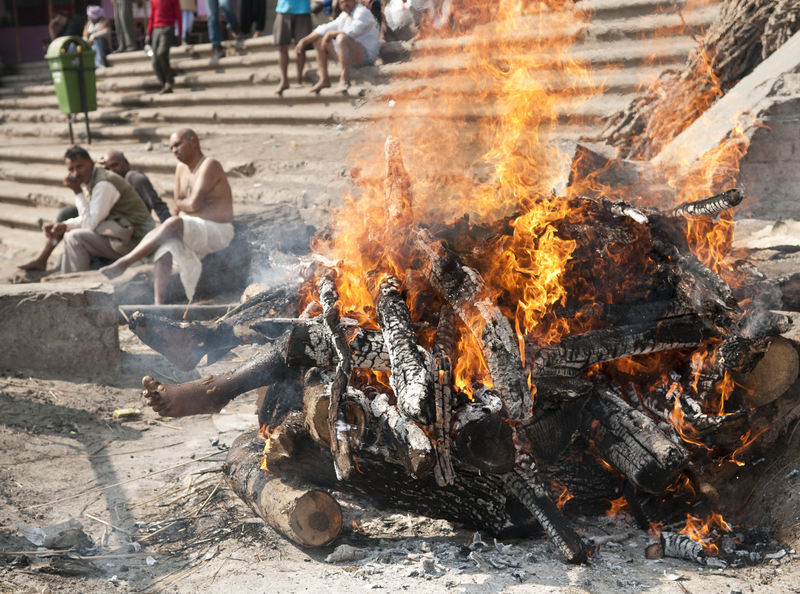 The cremation with pyre is rather expensive service, as around 500 kg of wood is necessary for it. Rich families buy barwood for aromatization. At the same time, poor ones have no money for wood and often light the token bonfire, after which the burnt body is thrown into the river, so the flow of dead bodies is not something extraordinary in Varanasi. We should note that there is a taboo about the pyres touching upon certain citizens: Sadhu saints, children, pregnant women and leprotics. Their bodies are simply thrown into the river. There are so many bodies in the water, that there are even people who make their living by clearing the river from them. Those who had died out of unnatural reasons are cremated separately. 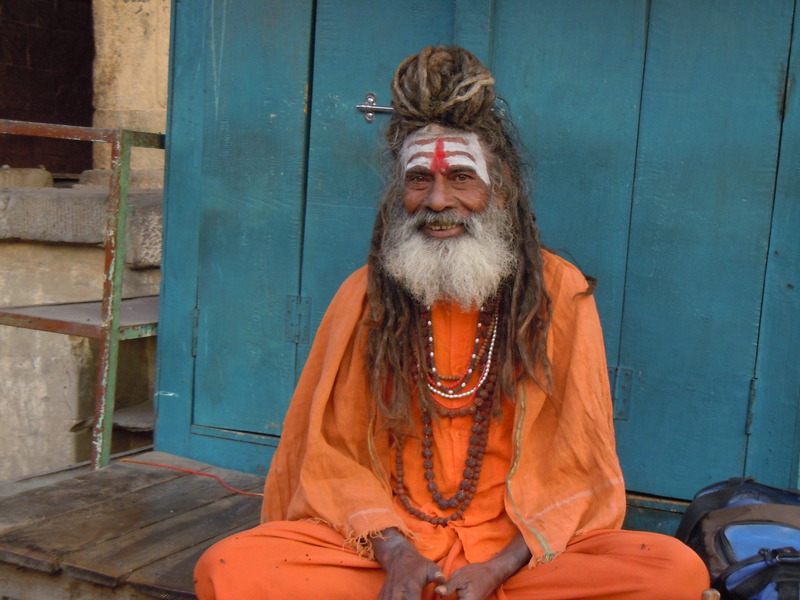 The city's outskirts are inhabited by the gloomy Aghori, who "fish out" the bodies and use them in their rituals from time to time. During the filming of a documentary about Varanasi for the Discovery channel, Ganges' water was sent to laboratories for an analysis. It was found out that some toxins' concentration was off the average by hundred times. It's a miracle that local people swim, wash their clothes, brush their teeth and perform their ablutions in the river every day and not suffer from it. The city is also a sacred place for Buddhists. It's thought that in the outskirts of the city, in Sarnath, Buddha Shakyamuni reached enlightenment and passed Four Noble Truths to his followers. Varanasi is really multifaced: you can see fashionable hotels and crowds of beggars, yogi saints and sellers of banned stuff, tourists, film crews, people in search of self-development and simple travelers. If you are in India, don't forget to visit this city which will help to feel the complicated ancient culture of India, despite the abundance of unpleasant for European eyes' features.